Ipswich City Council is proud to have a Street Tree Program that allows residents to request free street trees to plant on their property. Improve your street appeal by requesting a free street tree at the front of your property. Your street tree not only adds to the visual appeal of your property, it provides cleaner air and cooler, greener, more comfortable pathways for walking and cycling. 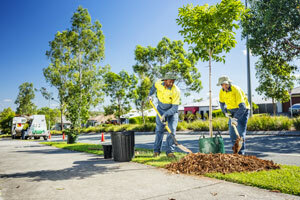 Commit to watering in your street tree and be part of making Ipswich a greener and more liveable community. Click on ‘Footpath Tree Requests’ and follow the prompts.